Very recently, we saw the official presentation of the three models of the latest series from the manufacturer Samsung, as it turns on Samsung Glaxy A9 - which is among them - we received not so long ago few new details about its specifications. 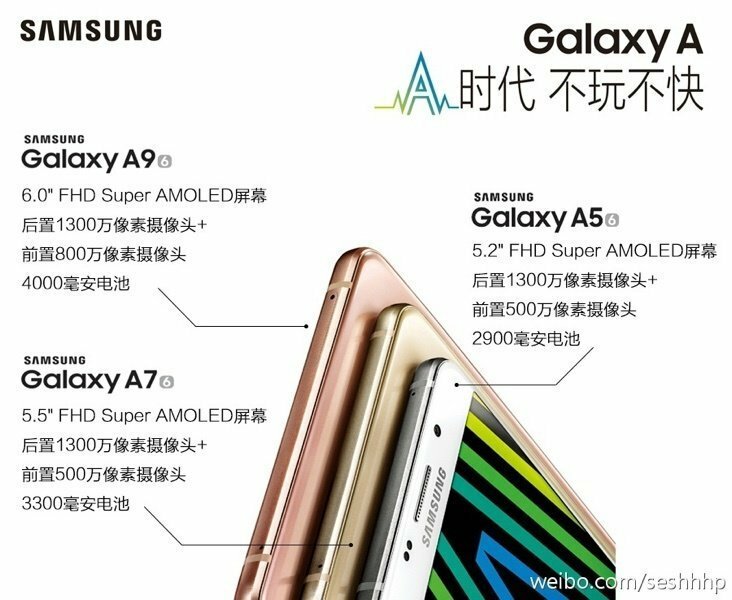 In terms of the appearance model does not practically differ from the rest of smartphones in A series, it will be only larger than them. The display will have a full HD resolution diagonal of 6.0-inches and is made in the Super AMOLED technology. The latest flagship will be equipped with capacious battery with a capacity of 4000mAh and a 13-megapixel rear camera, and when it comes to the interior of the phone, the Galaxy A9 is expected to receive 620 Snapdragon processor with four cores clocked at 1.8 GHz A72 and four A53 1.2 GHz, which will be backed by 3GB of memory. For users files, manufacturer allocated 32GB of internal memory, but we do not know anything yet about the possibility of extending the memory using a microSD card.